Global warming: Antarctica is losing more than 6 billion tons of ice annually. 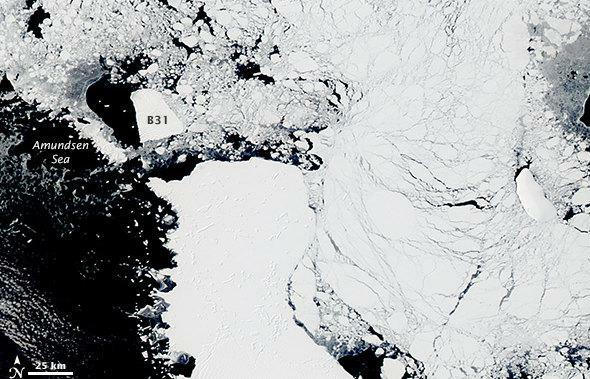 Iceberg B31 recently broke off of Pine Island Bay in West Antarctica, where a new study confirms land ice is melting faster than ever. Bergs this size (note the scale) are not unheard of, but the region has been shedding them faster than anywhere else in Antarctica. A new report from NASA and UC–Irvine confirms—again—that Antarctica is melting away. The scientists used observations from four different techniques to measure the amount and change in rate of ice loss from a region in West Antarctica. This area was already known to be melting at an astonishing rate; a recent study using Cryosat 2 showed that in the period from 2010 to 2013, the region was losing ice to the tune of 134 billion metric tons of ice per year. The new study looked at four observation sets covering the years 1992–2013. They found that on average over that time, ice loss from West Antarctica was about 83 billion metric tons per year … but the average increase in that loss was 6.1 billion tons every year. By the end of the time range, the numbers between the new study and the one from CryoSat2 are consistent. 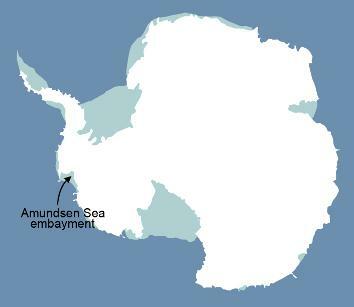 The location of the Amundsen Sea embayment, where the studies were done. But it’s worse than that. We’re not just losing more ice every year; the rate itself is accelerating. We’re losing ice faster now than we were 21 years ago, and the rate at which we’re losing ice has more than doubled that average over that time span. Think of it this way. Imagine in a given year that area lost 100 billion tons of ice. At an increase of 6 billion more tons per year every year, then the next year it would lose 106 billion tons, then 112 the year after that, and so on. But in fact that loss rate is increasing. So it goes from 100 billion tons one year to 106 the next, then (say) 113 the year after that, to (say) 121 after that … The new study indicates that at the more recent end of the time range (2003-2011), ice loss is accelerating by nearly 16 billion tons per year every year. This is the same math as freefall, an apt analogy. Antarctica is melting. Fast. And this isn’t some natural variation, it’s not sunspots, it’s not the Earth’s orbit changing. It’s us. These changes aren’t happening on geologic or astronomical timescales, they’re happening on human timescales. We’re dumping carbon dioxide into the air at an accelerated rate, and there’s now more CO2 in the atmosphere than there has been for at 800,000 years. As my Slate colleague Eric Holthaus points out, the North Pole is draining away as well. We’re melting at both poles†. For decades, we’ve played at geoengineering by accident. Now we know what we’re doing, and it’s time we stopped playing. The deniers may stick their fingers in their ears and ignore or distract or sow doubt about what’s going on around them, but the rest of us can hear what our planet is telling us quite well. The science is in, the scientists agree, and the global thermometer keeps rising ever upwards. After all this time, maddeningly, we’re still at Step 1: acknowledging the problem. It’s way past time we got past that and started doing something about it. †As always, don’t be fooled by people saying Antarctic sea ice is growing. Its growth is tiny, far smaller than what’s being lost, and sea ice comes and goes every season; the ice loss in West Antarctica is from glaciers on land, and won’t be coming back. *Correction, Dec. 3, 2014, at 14:30 UTC: I originally wrote that mass loss was increasing at 6 billion tons per year, but neglected to add that this loss was accelerating, and is now at 16 billion additional tons per year every year. My thanks to Twitter user @didaclopez for pointing this out.